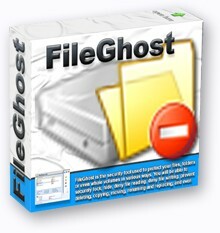 FileGhost is the security tool used to protect your files, folders or even whole volumes in various ways. You will be able to securely lock, hide, deny file reading, deny file writing, prevent deleting, copying, moving, renaming and replacing, and even prevent file attributes or file time stamp changes. FileGhost is excellent supplement for anti virus and other anti-malware software. These protections can be applied on any particular file, folder, hard disk volume, CD/DVD-ROM, flash card or any other storage device on your computer, regardless of the file system (FAT or NTFS) used on it. Additionally you will be able to use many other security options, among which you can protect access to program by setting password and thus effectively prevent others from changing options you set. User interface is intuitive and very easy to use, just drag and drop your files and set desired checks - protection will be activated immediately. You can use FileGhost to protect your important data from other people but also from malicious software such as viruses, trojans, spyware and others. Note: FileGhost does not change the file system nor file's data. It just provides on-the-fly protection for your files. You cannot lose your files. Completely conceal your important data from Windows and all other programs (including viruses, trojans and other malicious software). Prevent stealing files from your system. Protect access to FileGhost with password. Automatically protect after screen saver is activated or user inactivity detected. Hide FileGhost presence on the system. Use hot key to quickly hide and show main user interface.